Frankie Muniz (Malcolm) has been passionate about basketball for a long time and has previously participated in the HoopLA Celebrity Basketball Game back in 2004 as well as some other similar celebrity shootout events in the past. Frankie announced today on Twitter that he will be taking part in the 2010 Phoenix Suns Celebrity Shootout happening this Sunday, March 7th. Join us on Sunday, March 7th at 2 p.m. for the 9th Annual Jack in the Box Celebrity Shootout, presented by Robert and Carole Machiz. Nearly 20 entertainers representing the television, movie and recording industries will descend upon Phoenix to play in this charity basketball game at US Airways Center. All proceeds benefit Phoenix Suns Charities, Suns Nite Hoops and Cox Charities. 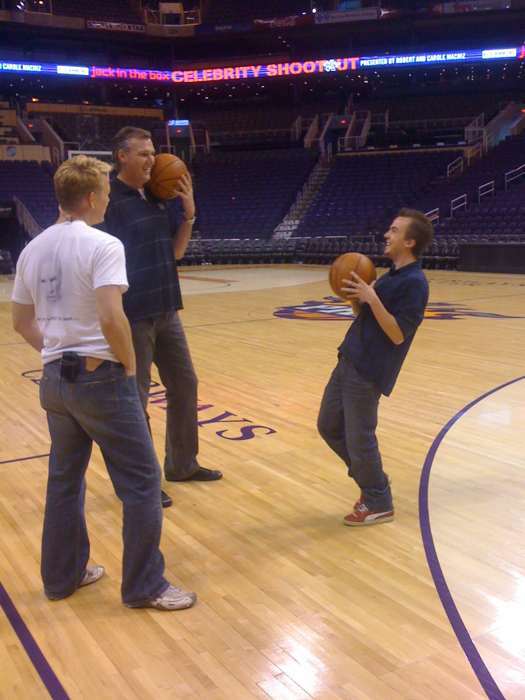 Shootin hoops on the @PhoenixSuns court with @FrankieMuniz, Tom, and Cory. Fun morning to say the least. You can find out more information about the event and purchase tickets (for those of you near Phoenix, Arizona) from the official event page. Frankie is also keeping himself busy playing drums with his new band You Hang Up; we’re told they have some “hot new songs in the works”. It seems that no firm racing plans for the upcoming season have been announced by Frankie and it does seem a little unclear right now whether his main focus for this year will be his role in You Hang Up or his racing career. If you are interested in seeing what he is up to, you can of course follow his Twitter account @frankiemuniz.